Blog Quick Quotes: Kids with scissors (oh no) & a free electornic die cut file! Kids with scissors (oh no) & a free electornic die cut file! can leave us feeling a bit empty the day after (or stuffed - lol). Melin has a free electronic die cut file just for you! This collection was perfect for the layout of my daughter cutting her hair. She gave herself a small pair of bangs. You can tell in her photo she was trying to look “sorry,” but really thought it was funny. The fun colors and sayings from the Julie Je T’aime collection were perfect for conveying the fun message. I tore some of the pattern paper to give some texture to the layout. The 3-in-1 Beacon glue is great for adhering the flowers. I love the strength of this glue. 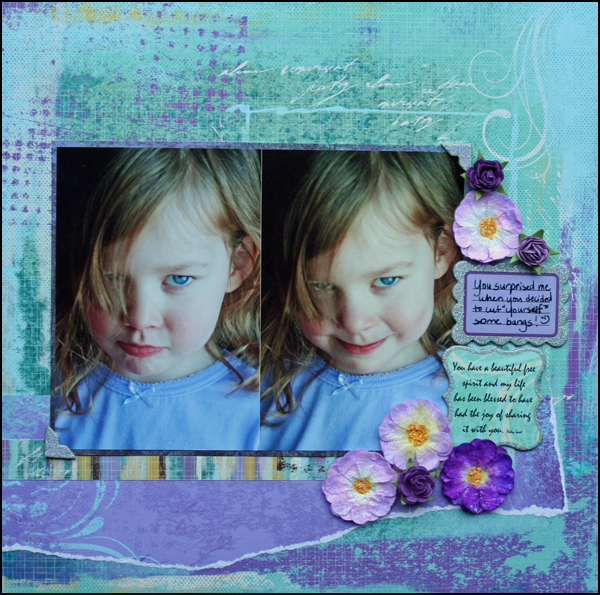 I am sharing a quick and easy layout I made today featuring the Quick Quotes Club Q December kits. These kits come together so easily and with just a few small changes, you can have a wonderful layout done in no time at all. Here is my layout. I created it using all product from the Club Q kit as well as some Maroon Cardstock, white cardstock and white pigment ink. I also used the Amaretto and Bloody Mary Powder Puff chalk inks. The Poinsettia die cut was a free cut from the 25 Days of crafting fun on my blog. If you would like the free electronic die cut file you can get it by clicking this “add to cart” button. It will not cost you anything to download. The file comes in the following formats: AI, DXF, EPS, GSD, KNK, MTC, SCAL2.0, SVG and WPC. This will be free for a limited time. It is for non-commercial use only. Be sure to download it while you can. Beautiful layout Julie. Love the colors!!!!!! Such cute pics. I remember my daughter doing this. Beautiful layout Melin. Love the paper, of course. The pointsettia is beautiful and love that big bow. Cute layout. I get an error 404 not found after clicking on where indicated to click for the Poinsettia cutting file.